Gymnocladus dioica.leaf.© 2008.Fontenelle Nature Asssociation.www.fnaturesearch.org (Accessed 1/2017). Gymnocladus dioica is a tree to 30 m tall, twigs very stout, often whitish, leaf scars large, shield-shaped, buds silky, pith pinkish (Petrides 1988). 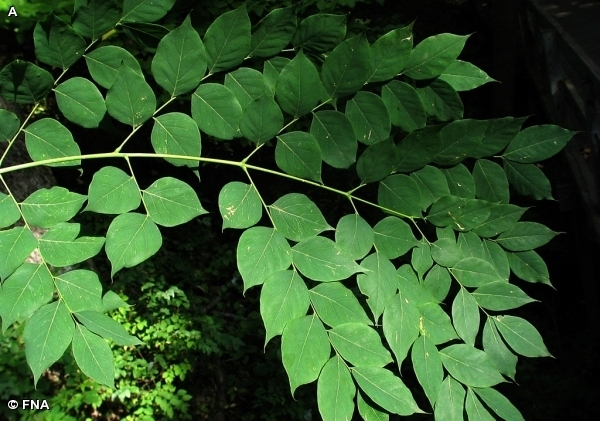 Leaves alternate, twice pinnately compound, often nearly 1 m long, 3-6 pairs pinnae, leaflets to 8 cm long, 4 cm wide, margins entire, sometimes the lower pinnae replaced by leaflets. Flowers greenish- white, regular, softly hairy, about 2 cm wide, in branched clusters to 20 cm long at ends of stems. Gymnocladus dioica.fruit.© Roland E. Barth.Fontenelle Nature Asssociation.www.fnaturesearch.org (Accessed 1/2017). 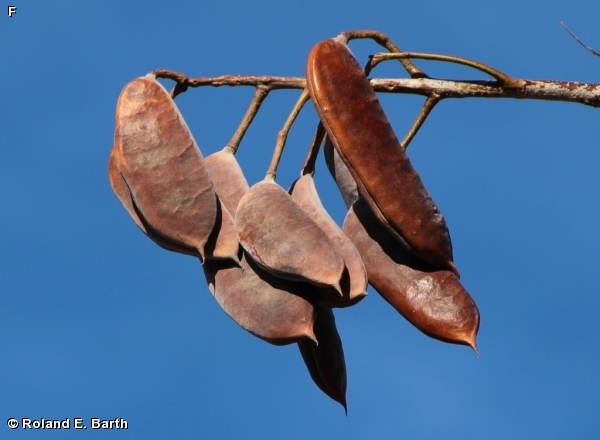 Fruit pod to 25 cm long, 5 cm wide, thick, flat, turning blackish-brown, persistent into winter or spring; seeds to 1.5 cm, hard. Seed dispersal; see Gleditsia triacanthos. Origin: Native to small area of south-central NYS. Habitat: Escaped from cultivation. Appears shade tolerant and colonial from root sprouts (Gargiullo personal observation). Tolerates soil pH 6-8 (USDA, NRCS 2010).